There are quite a few brands of boat with whaler in their names and although they all look similar, none of them resemble whaleboats. Instead they are cathedral-hulled boats, usually double skinned and foam-filled. interestingly, not only is the lowest price brand WA built but it is $1,000 cheaper now than it was four years ago. According to the builder, Nigel Johnson, of Ocean Whaler Marine, while material prices have been rising, he has been streamlining production techniques. It is essentially a simple structure. there is so much form stiffness in the outer skin and the only other extra rigidity needed is provided by the foamed-in-place floatation. This is very tough stuff, making a strong boat as well as one with level flotation. With a 5.65m length and 2.1m beam, it does not spell out a big boat but a near-rectangular platform means it has a lot of room. And that shape, plus the wing hulls, gives it extraordinary stability. Two men, weighing more than 180kgs in total, standing at one rail caused an insignificant list. Most Ocean Whaler buyers are either dedicated fishermen or they buy them purely for river use. Space and stability are the attraction for both, but a slipperyness of hull is an added river attraction. The Ocean Whaler slipped along for us at 5 to 8 knots on a tiny throttle opening, the motor barely under load and the bow showing no inclination to rise. We were powered by a Suzuki 90, the first smaller block Suzuki 90 in Australia. It took us to a top speed of 35 knots across a short, low sea. A little juggling with trim and the Ocean Whaler mastered the seas from every direction, giving virtually hands off tracking and an excellent ride. Turns felt as though they were made on rails, with the boat leaning into them monohull-style. Driving is done at a centre console, sitting on a reversible double seat, or standing, with plenty on handhold provided. 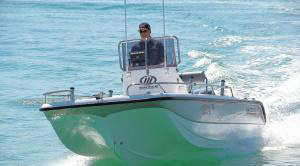 The console is cleverly moulded to provide the right surfaces for the monitors and electronics that included, on our boat, a Navman 8084 plotter-sounder, a VHF radio, and stereo system. A nice touch was the 12-Volt socket to power iPods or recharge mobile phones. Under the drivers seat is usually a two level locker but our boat had an insulated ice box instead that could easily be converted to a live bait tank. More cold storage is provided by an esky ahead of the console with an upholstered seat top. There are seats for more people than are likely to be carried. There is also a pair of removable quarter seats and an upholstered platform forward. Those using the quarter seats can use a grab rail curving around the top of the motor well. The sides are low by most 5.5m boat standards but guardrails effectively raise them to a reassuring height. A good result of the low freeboard is low wind resistance and consequently, slow drift when fishing. The windscreen lowers for reduced air drag under tow. Storage space is good. There is storage in the console and under the forward platform, which is partly consumed by anchor and line stowage, but fishing benefits from the elimination of snags around the bow. Stowage caters for rods too. Besides four sockets attached to the guardrails, there are fold-out racks for horizontal stowage along the bulwarks. The photograph shows a boat without shade and various Bimini options boost the price by $1,500 to $3,000. But even on the basic model the agents provide a simple awning at no extra cost, which means that for $34,990 a buyer gets a boat ready to roll, no electronics and 60hp four stroke outboard.